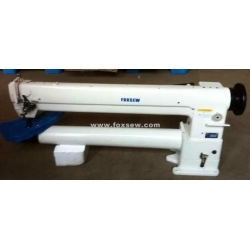 Features: FX-8341-760 model Long Arm Double Needle Cylinder Bed Unison Feed Extra Heavy Duty Machine ,with the compound feeding of needle feed dog and presser foot prevents the slippage of materials and forms net stitch. 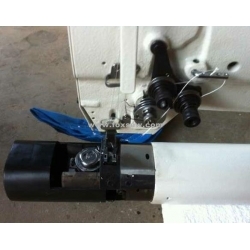 Adopt sliding thread take-up, imported vertical double rotating hook and forming two lines of lockstitch. the arm shaft and hook shaft are driven by synchrony tooth belt. 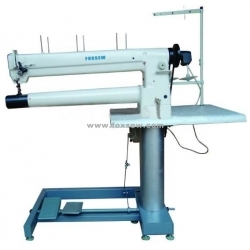 Knob-type stitch regulator and lever type reverse feeding mechanism permit convenient operation. and install clutch safe device to prevent the damage. It is widely used in sewing tents, arch, umbrella, seat cushion, sofa etc,Saddles, Bridles, Harness, shoes, football, hot air balloon,luggage cases, suitcase… especially for filter bags cylindrical products.